Successfully Added DVB-T USB Digital TV Receiver - MPEG-1 + MPEG-2 Recording to your Shopping Cart. 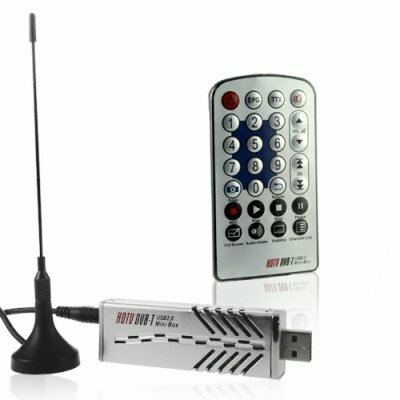 USB dongle DVB-T digital television receiver for watching free DVB-T broadcasts straight on your computer, and featuring the ability to record in MPEG-1 or MPEG-2 formats, perfect for burning on DVD discs and playing on your home DVD player. Using this included powerful programs on the CD, you will be scheduling recording times and watching different parts of programs that you are watching even as you record it. A perfect computer accessory for turning your computer into a digital TV viewing and recording center at an absolutely unbelievable low wholesale price. Note: DVB-T reception is not available in every country. Please make sure to see if DVB-T is available in your region before you purchase. I would probably give the item 5 stars if I lived in a country where it worked. The fact that it was recognized by both Windows XP MCE and Windows Vista without complaining about incompatable drivers is what provided the 3 stars for me. The item doesn't indicate what countries it will not work in, unfortunately it does not work in the USA. Although I had configured it for the UK, and the rest of the installation was flawless, except I'm not in the UK so I couldn't recieve any broadcasts. If you're in the USA, this item doesn't work, other countries, make sure your Digital Terrestrial TV is on the 6/7/8 Mhz bands (UK I know it will support, not sure about where else) Installation was very easy though, and the magnet for the antenna's base is very strong.